The 3.75m x 1.5m is the ultimate storage unit for narrow places. This shed is a fantastic solution if you have a narrow strip but still want decent storage! Q: I would like to know if we can have this as a reverse fall skillion so low side as entry and high side as back? 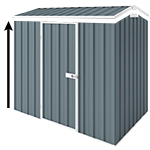 All of our Durabuilt EasySHEDs with skillion roof are sloping towards the back, that is how they are designed and engineered and unfortunately they cannot be reversed. And also please feel free to check out Durabuilt's OTW range which come with skilliion roofs sloping towards the front however they are designed to be placed against walls as they do not have back walls. Q: also we would like to have one single sliding door as close to the corner as possible, is this ok? Yes, you can upgrade the standard hinged door to a sliding door by adding the 'Single Sliding Door' option to your order from the accessory list, that's not a problem at all. And the door can be placed one wall panel away from the corner which is 750mm wide. Q: what is the precise overhang length on the front and back of the shed? The roof overhangs approx. 200mm. Q: does this come standard with a latch/lock to secure shed? The door comes with a hasp and can be easily locked with a padlock, however padlock is not included in the kit. For extra security you can also add a Locking Door - T Shape Handle to your shed from the accessory list. It is only suitable for hinged doors though. Q: and how much of this shed is assembled i.e. do the back and front panels only have to be connected to the sides? Our sheds come in kit format, therefore the walls and roof need to be assembled. Just for your information, walls and roof panels are 750mm wide. Q: is this backed by durabuilt 20 year warranty? Sure, all of our Durabuilt EasySHEDs come with 20 year warranty. Q: and finally what is the packaging dimensions and amount of boxes in regards to this model?